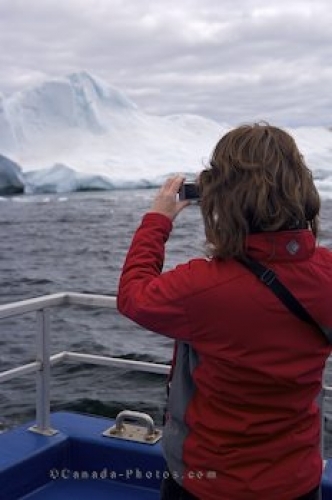 If you board the Gaffer III for an Iceberg Watching Tour in Newfoundland, Canada like this tourist, you will be amazed at the natural beauty of the scenery in Iceberg Alley. A passenger takes a picture of a massive iceberg that has made its way to Iceberg Alley after a long journey. Picture of a tourist enjoying the scenery of Iceberg Alley in Newfoundland, Canada.